Stings and bites from insects are common. They often result in redness and swelling in the injured area. Sometimes a sting or bite can cause a life-threatening allergic reaction or transmit pathogens (viruses, bacteria or parasites, for example) to humans. Arthropods are insects that live primarily on land and have six legs. They dominate the present-day land fauna. They represent about three-fourths of known animal life. In fact, the actual number of living species is not known and is estimated to be over 10 million. However, the majority of people lump insects, arthropods, and anything small that bites or stings as a "bug" or an insect. The goal of this article is to provide an overview of biting and stinging insects or bugs without making strict scientific definitions of insects or bugs. The article covers the predominant biting and stinging bugs seen or imported to the US recently, but does not cover every possible stinging or biting bug or insect worldwide. Black widow spider. Note the characteristic hourglass abdominal markings. Click to view larger image. Most insects do not usually attack humans unless they are provoked. Many bites and stings are defensive. Insects sting to protect their hives or nests or when incidentally touched or disturbed (so hives and nests should not be disturbed or approached). A sting or bite injects venom composed of proteins and other substances that may trigger an allergic reaction in the victim. The sting also causes redness and swelling at the site of the sting. Bees, wasps, hornets, yellow jackets, and fire ants are members of the Hymenoptera family. Bites or stings from these species may cause serious reactions in people who are allergic to them. Death from bee stings is 3 to 4 times more common than death from snake bites. Bees, wasps, and fire ants differ in how they inflict injury. When a bee stings, it loses the entire injection apparatus (stinger) and actually dies in the process. A wasp can inflict multiple stings because it does not lose its injection apparatus after it stings. Fire ants inject their venom by using their mandibles (the biting parts of their jaw) and rotating their bodies. They may inject venom many times. Puss caterpillars (Megalopyge opercularis or asp) have hollow "hairs" or spines (setae) that break when touched and toxin is injected into the skin. In contrast, bites from mosquitoes are not defensive; mosquitoes are looking to get blood for a meal. malaria is caused by an organism that spends part of its life cycle in a particular species of mosquitoes. yellow fever to humans and other animals. Lice bites can transmit epidemic relapsing fever, caused by spirochetes (bacteria). Leishmaniasis, caused by the protozoan Leishmania, is carried by a sand fly bite. Sleeping sickness in humans and a group of cattle diseases that are widespread in Africa, and known as, are caused by protozoan trypanosomes transmitted by the bites of tsetse flies. Bacteria-caused diseases tularemia can be spread by deer fly bites, the bubonic plague by fleas, and the epidemic typhus rickettsia by lice. 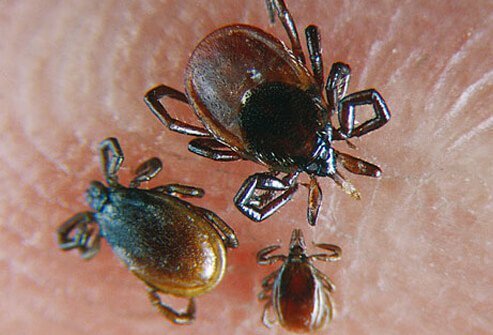 Ticks (arachnids) can transmit Lyme disease and several other illnesses through their bites; ticks bite so they can obtain a blood meal. Other arachnids (bugs) such as chiggers, bedbugs, and mites typically cause self-limited localized itchiness and occasional swelling. Serious bites from spiders (arachnids), which are not insects, can be from the black widow or brown recluse spiders; the spiders bite usually as a defense mechanism. Other insects and bugs can transmit diseases by simply transferring pathogens like Salmonella spp by contact. For example, in unsanitary conditions, the common housefly can play an incidental role in the spread of human intestinal infections (such as typhoid, bacillary and amebic dysentery) by contamination of human food as it lands and "walks" over foods after previously "walking" on contaminated items like feces. The skin may be broken and become infected. If not treated properly, these local infections may become severe and cause a condition known as cellulitis. You may experience a severe reaction beyond the immediate area of the sting if you are allergic to the bite or sting. This is known as anaphylaxis. Stings from large hornets or multiple (hundreds or thousands) bee stings have been reported to cause muscle breakdown and kidney failure and death. Bites from a fire ant typically produce a pustule, or a pimple-like sore, that is extremely itchy and painful. Ant bites are usually seen singly or in small clusters and each bite may develop a small central area of pus. In the past few years, researchers have found that tick bites (from the lone star tick) can generate an allergic response to red meat (beef, pork and venison, for example) and even milk. These problems may occur from the bite and the antigens that accompany the saliva during the bite or sting. The added problems of pathogen transfer during the bite, sting or feeding process are detailed in separate articles and will only be mentioned briefly in this general article. Hives are the most common systemic symptom. They appear as irregular, raised, red blotchy areas on the skin and are very itchy. If hives are the only systemic symptom present, they are often treated at home with an antihistamine but if other symptoms such as shortness of breath and/or other symptoms listed below occur, 911 should be called. If you start to experience symptoms that are not just at the site of the bite or sting (or if you have a history of severe reactions), seek medical attention immediately. These symptoms (systemic symptoms affect the whole body) may progress to fatal anaphylactic shock. If the bite appears infected (redness with or without pus, warmth, fever, or a red streak that spreads toward the body), see a doctor immediately. If you don't know what bit or stung you, it is important to keep watching the area closely to be sure it does not become infected. Call your doctor if there is an open or ulcerating wound, which may suggest a poisonous spider bite. The diagnosis of a reaction to a bite or sting is usually obvious from the history. The doctor will perform a physical examination to look for effects of the bite or sting on various parts of the body. If you can safely provide an example of what bit or stung you, it can be very helpful to the medical caregiver to determine both diagnosis and treatment. Examination of the skin, respiratory system, cardiovascular system, and oral cavity are particularly important to determine both diagnosis and treatments. To identify the disease that is transmitted by biting or stinging bugs or insects, blood tests are usually required; once the definitive diagnosis is made (for example, Lyme disease, West Nile virus or malaria), specific treatments then can be started. Treatment depends on the type of reaction to the bite or sting. If there is only redness and pain at the site of the bite, application of ice is adequate treatment. Clean the area with soap and water to remove contaminated particles left behind by some insects (such as mosquitoes). These particles may further contaminate the wound if not removed. Refrain from scratching the bite or sting area because this may cause the skin to break down and an infection to form. Intermittent cold packs or ice may reduce swelling. You may treat itching at the site of the bite with an over-the-counter antihistamine such as diphenhydramine (Benadryl) in cream or pill form. Calamine lotion also helps relieve the itching. Emergency treatment at home for more serious allergic reactions is available. People who have a history of severe reactions to bites or stings may have been prescribed an anaphylaxis kit (n kit). The kit contains an epinephrine injector (you give yourself an injection), tourniquet, and an antihistamine. The kit should be used according to the doctor's instructions. The treatment should be followed by an evaluation in an emergency department to be sure the person recovers completely. Treatment for serious reactions to stings or bites should be done in the emergency department. Treatment may begin with epinephrine (subcutaneous); diphenhydramine (Benadryl) and steroids (drugs in the cortisone family) are also usually given IV. Oral antibiotics may be given for infected bite wounds. For seriously ill people, an IV will be started, oxygen given, and a heart monitor used until the symptoms have improved with medications. In the emergency department, you may be instructed how to use an emergency kit in case of future stings to prevent a severe reaction that could result in death. The anaphylaxis kit contains an epinephrine injector, tourniquet, and an antihistamine. You may be referred to an allergist for desensitization therapy. After testing to determine which venom you are sensitive to, the doctor will gradually increase the doses of venom injected over time. Desensitization is usually effective in preventing a severe reaction to future stings. You can minimize your exposure to insect bites and stings by changing your patterns of activity or behavior. Have a professional exterminator or hive keeper remove or destroy nest or hives of biting or stinging insects or bugs; do not attempt such actions by yourself. Some vector mosquitoes are most active in twilight periods at dawn and dusk or in the evening, so avoid outdoor activity during these periods. Wear long-sleeved shirts, long pants, and hats to minimize the areas of exposed skin. Shirts should be tucked in. Use insect repellants. Repellents applied to clothing, shoes, tents, mosquito nets, and other gear will enhance protection. Permethrin-containing repellents (Permanone) are recommended for use on clothing, shoes, bed nets, and camping gear. Permethrin is highly effective as an insecticide/acaricide (against ticks and mites) and as a repellent. Permethrin-treated clothing repels and kills ticks, mosquitoes, and other arthropods and retains this effect after repeated laundering. Such treated clothing is thought to pose little danger for poisoning to humans wearing it. Repellents containing DEET (N,N-diethylmetatoluamide) as an active ingredient are recommended by most authorities. Formulations containing 30% DEET or less are recommended by some researchers because the additional gain in repellent effect with higher concentrations is not significant when weighed against the potential for toxicity, which include rare cases of encephalopathy (brain infection) in children. Follow the directions on the bottle or spray can to avoid toxicity to children and adults. Most people respond well to home or emergency treatment for bug bites or stings. People with very severe allergic reactions or those who do not respond to initial treatment will often require hospital admission for further treatment and monitoring. A severe episode may be fatal in spite of appropriate medical treatment. For people who get a disease transferred from insect/bug bites or stings, the outlook depends on the disease transmitted, how quickly it is diagnosed, appropriately treated and the overall health of the individual. Outlooks or prognoses of these diseases may vary from good to occasionally poor if organs are permanently damaged. Treatment of spider bites depends heavily on what kind of spider bit the patient. Black widow and brown recluse spider venom has very different effects, and both species have specific, identifying characteristics. 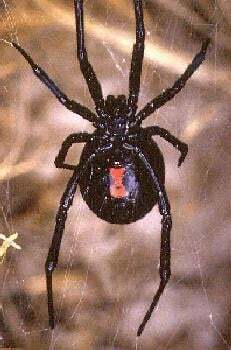 Black widow spiders (Latrodectus mactans) may be black or brown with a leg span of approximately one to two inches. They usually have a red hourglass marking on the abdomen. Brown recluse spiders (Loxosceles reclusa) are brown with a 1-inch leg span. Many have a violin-shaped marking on the chest. CDC.gov. Fight the Bite for Protection from Malaria Guidelines for DEET Insect Repellent Use. What symptoms did you experience with your insect bites? Please describe your experience with insect bites.